In today’s working style and manner, there is no particular office plan layout that can suit every office plan. There is no specific one size layout that meets the requirements of all the offices. So, here we are discussing a step by step process of what is an enclosed office and the advantages and disadvantages of a closed office layout. What are Closed Office Layouts? The other name for closed office layout is enclosed office or private office layout. This office layout uses cubicles and panels which help to create a separate office space for every employee working in the office. In the late 60’s American designer Robert Propst made an office design and he called it “Action Design”. In his design, he used panels and cubicles to make separate space for every employee working in the office. A closed office design can also be stated as an office layout, where different rooms are given to every department and organization working in the company a separate space, such that each employee working in the company has a separate working space of their own. A closed office is also a portioned or private office, as it gives private space for all the individuals working in the office. The concept of closed office, however, has declined over the years due to the upcoming trend of open office layout. But still, it is popular with those who love their own space and don’t like to be disturbed while working. Nowadays most of the offices are redesigning and organizing their workplaces as per employee convenience. If employees working in the company are happy, it automatically reflects in the productivity of the company, therefore increasing company growth and success. If the organization is able to take care of employee needs, then the employees will look after your organization. Be it cubicles or open spaces, every office design has its own pros and cons. Also redesigning the office space every other day would be a drag process. Both open office layout and close office layout have their own pros and cons. So let’s highlight certain close office layout ideas. Designing an office area speaks a ton about the people working in the office. The design of the office area shows what kind of atmosphere does the people working in the office gets and what goals do the employer is trying to achieve. A closed office layout reflects that the people working there love their privacy and would like to avoid any kind of distractions in their working time. While designing office layout several factors have to be kept in mind, especially the space available. Along with it factors like a sound requirement, accessibility to various requirements of the office and the role performed by different employees in the office. Sound pollution is one of the major distraction to the employee in reducing their productivity. For example, the distraction caused by the on call team may cause a lack of performance by the planning team. So, while designing the layout of an office a planning is strictly required. Planning is an essential part of the layout so that any kind of problem may be avoided and if any problem arises, a solution can be easily found out for the same. The furniture designed for any office shall be such that it makes the place more lively and fun for all the employees for working there. The atmosphere of the office shall be such that it makes the environment more energetic and peaceful for the employees for their work process. The cost of construction is also an important factor which cannot be neglected. On this factor, depends all the other decisions as the decision if made wrong will make the work process less interesting. A closed office layout provides its employees with certain positive impacts which have a great influence on the productivity of the employees. Here is the list of certain advantages which can help the employees in their working process. One of the most important advantages of a closed layout is the privacy it provides to its employees. The privacy provided by the closed layout allows the employees to have their own area where they can think and do work without any distraction. The employee does not have to go out to take their important calls or if they want to have some important decision then they have their own space. The closed layout provides a distraction free environment to its employees where they can work without any disturbance from outside. The employees can work without any interruption that can sometimes be made intentionally and can focus more on their work. This helps the employees in increasing their productivity. Creative work requires a peaceful and calm environment. Those employees who work in the creative department require silent and calm work environment so that they can focus on their work and can give best results. Other employee’s discussions or gossip might disturb them. So it is always suggested that the creative team of an office shall be given their own space to work. In a closed layout, the hierarchical order is very clear as the better the office, the better the position of the employee in the office. The concept of ‘corner office’ was introduced very earlier, where the higher the position of the employee in the office, the better work place will be given to him. The closed layout introduces healthy competition in the office as it provides a better working place for those working in the higher position in the company. Thus, all the employees try to work hard and get a better position in the office. Since in an open office area all the employees are working in the same place, thus they get to spend more time together and thus they can easily gossip about everything. More the gossip in the office the chances of misunderstanding also increases, which can affect the relationships amongst the employees. The closed layout provides health safety for employees because if any employee catches a communicable disease, then he can work from within his own space without affecting the work of others. A closed layout increases the concentration of the employees as they work from their own place without any distraction. The employee can work more and meet the deadlines without any hassle. Employee when work with a free mind has increased productivity as they are able to concentrate better on their work and thus the output of the employees is better. If the productivity of the employee is better, thus the productivity of the company will increase in totality. If the productivity of the employee increase, then the income of the employee and thus the income of the company will increase simultaneously. This will allow the company to give better working facility to the employee and also better rewards for good work done by them. Since employees in the closed layout have their individual space, thus the noise pollution in such a setup is quite less. People converse in their limited area without disturbing others. In a closed layout, there are separate cabins or space which can be locked for all the employees so from the security point of view it is more recommended. There is some information in every office that is needed to be kept confidential so that is more possible in a closed layout. As every employee gets his own space he can work in his own style and can arrange the stuff according to his likes and dislikes. This way he is able to concentrate on his work and is able to give better results. As there is no gossip and interaction amongst the employees, the environment in the office is formal and apt for working. Everything has its advantages and disadvantages and so is a closed office layout. When an office is designed according to the closed office layout, then there are certain problems they have to face. 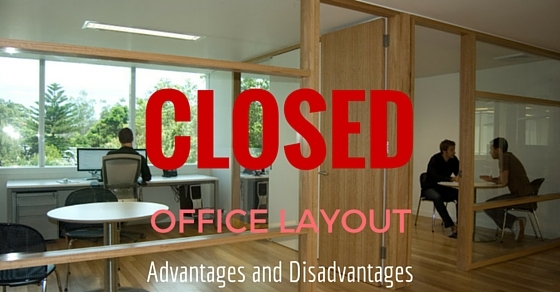 Listing certain commonly faced disadvantages of a closed office layout. In a closed office layout ,the supervisor has to face the problem in supervising the employees as he has to move from cabin to cabin to know what exactly the employee is doing at that point of time. This involves a wastage of a lot of time and thus more time is required in doing the work. There is less communication amongst the employees as they are in a less interactive position from one another. Employees work in their own space and communicate with each other only when required. So, there is a communication gap amongst the employees. A closed office layout requires more infrastructure as compared to the open office layout and thus the cost of building it is more. The quantity of raw materials like wood or stone or electrical fittings is more so the cost automatically goes up. Only those office’s which have the budget can afford a closed office layout. In a closed office layout where employees have their individual and private space, and sometimes can be misused as there is no direct check on them. This might lead to lower productivity of the employees and also the work of the company may suffer. Since in a closed office layout separate work place is built for all the employees this consumes a lot of space. This can effect the number of employees hired, as a separate working space for all the employees is needed. Whereas in an open office layout more employees can be hired as the space for all the employees is limited. Sometimes the employees may take advantage of separate space and can easily engage in negative behavior such as office romance. This may disturb the working environment in the office and the employees might get distracted. In a closed office layout if the employees have to communicate with each other they have to move from cabin to cabin. Sometimes in a hurry to meet the deadline, some employees might be left and thus the flow of work might be disturbed. As all the employees have their own workplace, there are chances that some information might not be able to be passed to all the employees and they may remain unaware of the affairs that are going on in the office. Since there is no communication amongst the employees in the company, there is no friendship amongst the employees and they are less united. This is a major drawback as lack of unity may sometimes become the cause of delay of work in the company. When an employee in the office has its own space and knows that there is no random check on his working this might make the employees lazy. This has a direct relation with the productivity of the employee. Every human being requires some friends and some moral support to achieve the goals they have set for themselves. There is human tendency to depend on others for some or the other reason. But, this factor is missing from the closed office layout as there is less communication amongst the employees. Whether an office is designed according to an open office layout or a closed layout, the most important factor that determines the productivity of the worker is his ability and determination to work. The employee who wants to work can work in any environment that is provided to him. So, all the employees shall work for the benefit of the company.